A week or so ago, I read a review in the New York Times that made me do something I haven’t done in quite awhile. I pre-ordered a book from Amazon. (The book was due to be released in just a few days.) Oddly, it was a book of short stories and essays, which is not my usual reading fare. And, stranger still, even though I’ve been in a bit of a reading slump lately, I ignored the stack of soon-to-be-due library books awaiting me, opened the box from Amazon, and sat down and read. 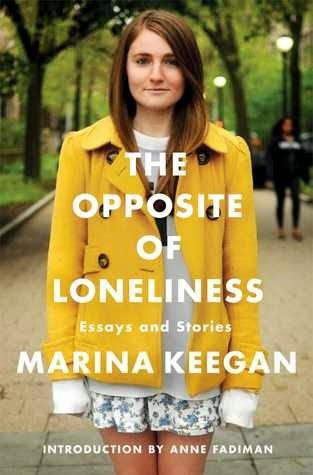 The Opposite of Loneliness by Marina Keegan is a moving collection from a startlingly talented young writer. Her short stories deal with a variety of topics from young love to the life of a contractor in Iraq’s Green Zone to the drawn-out last days of doomed researchers in a sunk submarine. I think the best ones are those whose protagonists are young adults in the throes of first love with all its passionate intensity, confusion, and disillusionment, but her skill in exploring human emotion is evident throughout. The essays are beautiful, and range from exploring how she (or more precisely, her mother) deals with her diagnosis of celiac disease to recounting a day spent in the company of an exterminator. She displays an admirable empathy for her subjects and a mature self-awareness. At the same time, she is young and she knows it. She accepts her youth as the gift that it is as she stands on the brink of graduation from Yale and the next phase of her life. Marina Keegan had already begun receiving accolades for her writing. She had a post-graduation job lined up at the New Yorker. And then, five days after graduation, she died in a car crash. The material for the book was compiled by friends and family with help from Anne Fadiman, who was Marina’s instructor and mentor at Yale. More details about this remarkable young woman’s life are available in the introduction and online. However, her parents have said Marina wouldn’t want people reading her work just because she’s dead. She’d want people reading the book because she had something to say. So should I mention the biography? How relevant is it? It doesn’t really matter whether I mention it or not, because it’s pretty impossible to read the book without being clued in to its backstory. But knowing about the tragedy does, subtly or profoundly, change the reading experience. Woven throughout some of the stories are a rather morbid preoccupation with death. In one story, the protagonist’s not-quite boyfriend has just suddenly died. In another, stranded submarine occupants await eventual death in total darkness. In her essays, although she celebrates her youth, she makes mention at times of things she will do before she dies or as she is about to die. It all seems so very prescient, but of course, it isn’t. Just as when she writes about herself and her peers having so much time to explore options and change their minds, or when she writes about her own future, a some-day pregnancy, it leaves the reader with a hollowed-out feeling. This girl was just bursting with life, with hope, with promise–with all that grand expectation and invincibility that comes with youth. The writing stands on its own, and yet, the emotional impact is greater—the reader is necessarily impacted—by knowing that the author died shortly after writing the words. Marina Keegan urged her fellow students not to settle for after-graduation jobs where they would forget about their passions, their ideals. The sentiments are inspiring and expressed with all the enviable enthusiasm and lack of cynicism of someone who still seemed to see the world’s most insurmountable problem as the eventual burning out of the sun. (And even that, she believed, could be gotten around with some ingenuity.) For herself, Marina wanted to beat the odds and be a writer—a challenge that could well seem, to today’s young writers, to be more impossible than engineering a solution to the death of the sun. The Opposite of Loneliness: Essays and Stories shows that Marina was up to that challenge. She was a writer. Don’t read the book because she’s dead. Read it because it’s wonderful. I had spring break off from work and spent a good deal of it in the car, so I packed several books, thinking I would finally get some reading done. However, I ended up sleeping a lot. Plus, we drove through some really pretty country and I spent more time than I should have just staring out the window. I wasn’t in the mood to read, which is bizarre. I did manage to finish one book, the book we chose for our next historical fiction/history book club meeting. 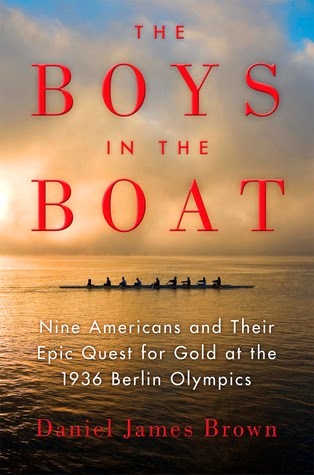 The Boys in the Boat: Nine Americans and Their Epic Quest for Gold at the 1936 Berlin Olympics by Daniel James Brown is one of those inspiring against-all-odds sports epics that make for such feel-good reads. It is primarily the story of Joe Rantz, who was a dirt-poor University of Washington student struggling to stay in school during the depression era. Although there were no scholarships available for rowing, Joe felt that earning a place on the crew team would solidify his position at the school. The book follows him from freshman tryouts through the Berlin Olympics, but it also flashes back to his childhood and the struggles that made him the resilient young man he became. The story is wonderfully descriptive about rowing and teaches an appreciation for the sport. It also does a nice job fleshing out the head coach as well as the boat builder who serves as an additional coach/mentor to Joe. Interspersed with the narrative of Joe’s years of college is the build-up to the Olympics in Germany, along with the increasing Nazi threat and the world’s reaction (or non-reaction) to it. The author is able to maintain tension throughout the book despite the fact that the ending to each of the narratives is not really in doubt. The writing is straightforward, and although somewhat repetitive at times, the book moves along at a good pace. It’s easy to root for these likeable characters. This is really Joe’s story with comparatively little information about his teammates. I would have liked to see the other boys in the boat get a little more attention. They were all potentially interesting men. Still, there was quite a bit of information to cover as it was, so it would have been difficult to include more biographical information on eight more people. The book is being compared to Unbroken by Laura Hillenbrand and I can see why, although certainly what Zamperini went through was orders of magnitude greater. Still, there is always something stirring about a come-from-behind sports story, especially when there is a villain to beat.